Members of the public with information regarding the incident have been urged to come forward to assist investigations. 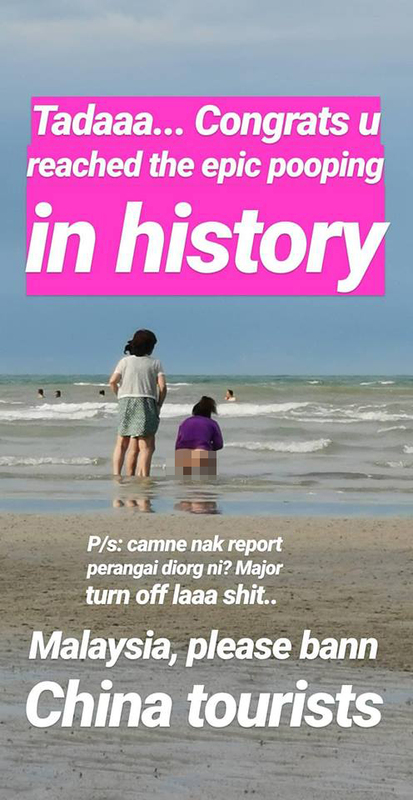 Twitter user Zudomon revealed that he caught the woman defecating on the beach in Batu 5, Port Dickson. The woman was accompanied by two other tourists, who apparently were on the 'lookout' for her. New Straits Times reported that MPPD president Mohd Zamri Mohd Esa expressed displeasure at the incident, and vowed to launch an investigation over the matter. Zamri also speculated that the woman might have had a stomach ache at the time of the incident. "We will work on building a toilet on the beach.. .We're still waiting for an RM8 million allocation to build it and it will be privatised," the MPPD president told Harian Metro. 15-year-old Natshatra Navanita and 16-year-old Divyaa Munian are both students of SMK Assunta, Petaling Jaya.